Prime Minister Manmohan Singh today gave a new slogan “Rozgar Badhao”, while asserting that the UPA government would work for employment-led growth and pursue economic reforms with a human face in the interests of working classes. 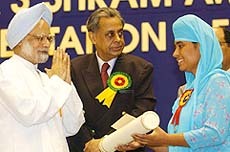 Dr Manmohan Singh presents Shram Devi Award to Ms Harjeet Kaur of Punjab at the Prime Minister’s Shram Awards presentation ceremony function organised by the Labour Ministry at the Vigyan Bhavan in New Delhi on Monday. Former Deputy Prime Minister L K Advani today came down heavily on the Congress-led UPA government for “negligence” of internal security resulting in serial blasts in Assam and Nagaland and held that its “guilt” was “of a far higher order”. Two British ministers are in India today, Defence Minister Geoff Hoon and International Development Minister Gareth Thomas, and three more are expected to come here later this week, signalling the two countries’ political will to raise the bar of their bilateral relationship. South Korean President Roh Moo-Hyun arrived here today on three-day state visit during which an extradition treaty and a treaty on mutual legal assistance in criminal matters are expected to be signed. German Chancellor Gerhard Schroeder would arrive here on October 6 on a two-day state visit, part of annual summit-level interaction between the two countries, institutionalised during Mr Schroeder’s last visit to India in October 2001. India and Korea are likely to discuss the proposal for a Free Trade Agreement (FTA) and other ways and means to enhance trade and economic cooperation between the two countries. Haryana strongman Bhajan Lal is going all out to set right the impression that his poor health has pushed him out of active politics. In an effort to silence his detractors, who have written him off in the coming Assembly poll on health grounds, Mr Bhajan Lal has chalked out a series of public rallies in the coming days. Political parties in Maharashtra have fielded more candidates with criminal backgrounds in this month’s Assembly elections than in the past, according to a report published by the Association for Democratic Reforms (ADR), a watchdog body. All major political parties in Maharashtra are worried about Mayawati’s BSP playing the role of a spoiler in the October 13 Assembly elections. With the BJP leader in charge of the North-East, Mr V. Satish, openly acknowledging the poor state of affairs of the party in Arunachal Pradesh after Mr Gegong Apang switched over to the Congress recently, the victory of the Congress in the coming October 7 Assembly elections now looks almost certain. The Election Commission today sought fresh clarifications from the government on the proposal to set up a new commission to examine the reservation for backwards among religious and linguistic minorities, as the Centre claimed that the move was not a violation of the Model Code of Conduct. The Supreme Court today sought the Centre’s response on a petition seeking the setting up of separate polling booths for Scheduled Caste and the Scheduled Tribe people in Haryana during the next Assembly elections and delimitation of reserved constituencies in four states. The Supreme Court today issued notices to the Centre, the Election Commission and all states on a petition seeking derecognition of the political parties with religious names attached to them. Acclaimed writers, Amrita Pritam and Prof. U. R. Anantha Murthy have been elected fellows of the Sahitya Akademi, an honour that the body confers on a writer. The SAD(Delhi) today decided to go ahead with the kar sewa at the gurdwaras in Pakistan, despite opposition by the SGPC. A five-member Indian delegation led by CBI Director U.S. Misra, who is also the Head of Interpol, Delhi, today left for Cancun, Mexico, to participate in the four-day 73rd General Assembly Session of Interpol beginning tomorrow. The disbursement of compensation among the Bhopal gas victims could not be started on October 1 because of the slow motion of the official machinery. Freedom fighter and former Orissa Chief Minister Nilamani Routray (84) died here today following prolonged illness. Former Prime Minister I K Gujral will visit Pakistan next week to attend a meeting of South Asians for Human Rights (SAHR). India, Myanmar begin border talks. Management honcho begins film career with school romance. “Time has come for us to add to the call of “Garibi Hatao”, a new slogan for our times — Rozgar Badhao (Increase Employment),” — he said after giving away the Prime Minister’s Shram Awards to 73 workers of the departmental undertakings of the public sector of the Central and state governments for “exceptional and outstanding” excellence for 2002 and 2003 at a function held here. The Prime Minister lamented that the last few years had seen the phenomenon of jobless growth.”There is need to reverse this trend so that growth translates into meaningful results for the working classes,” he said, adding that the government would soon introduce a Bill in Parliament on national employment guarantee that would ensure 100 days’ employment to all the able-bodied persons in rural areas. He disclosed that a draft Bill prepared by the National Advisory Council in this regard was currently under examination of the government. “Food for Work Programme would be launched in the next few days in 150 backward districts as a first step toward national employment guarantee,” said the PM. His remarks assumed importance as the Congress and other alliance partners of the UPA had made it an election issue that despite achieving a growth rate of 8 per cent the NDA government had failed to create adequate employment opportunities. In fact, the number of registered educated unemployed youth has crossed the 40 million mark. He said, “to achieve the objective of having job intensive growth, attention will have to be paid to agro-processing, rural industries and the informal sectors,” while emphasising that the government was committed to providing a favourable policy environment and direct support for the growth of these sectors. It would include technological upgradation, skill enhancement, credit support and marketing assistance. He said the government had already constituted a commission to examine the problems of enterprises in the informal sector, which would come up shortly with recommendations on the nature and scope of assistance, required by these enterprise from the government. He reminded the industry that “hire and fire” policies could not be implemented in the absence of “social security net” almost absent in the country. In the same breath, he did not forget to remind trade unions about the need for labour reforms and urged the business and labour organisations to engage in a productive dialogue with the government on this important issue. However, he added that for improving incomes, productivity and quality, the country would have to upgrade the skill levels of workers across all sectors. “A solution is self-evident. We will need substantial investment in skill upgradation and vocational training,” he said, emphasising the need for the active involvement of industry in the curriculum design and the management of training programmes. Meanwhile, four employees of the National Thermal Power Corporation (NTPC) were awarded Shram Awards by the Prime Minister Manmohan Singh today. Two employees from Dadri Power Station of NTPC were awarded Shram Bhushan and another team of two employees from NTPC’s Singrauli Power Station received Shram Vir award for the year 2002. “What is no less shocking is the casual and callous manner in which the Congress-led UPA government has dealt with the issue of internal security ever since it took the reins of office in May 2004,” Mr Advani told a specially-convened press conference here after a high-level meeting of the BJP leaders on the serial blasts in Assam and Nagaland which has claimed about 70 lives so far. Castigating the UPA government for hastily scrapping POTA, Mr Advani said it would not only be apt for the government to “review” its decision on the anti-terror Act but also revoke its decision to repeal it. “It is surprising that the country has a tougher law against blackmarketeers and drug traffickers but a softer law against terrorist and terrorist organisations... Presently, there is no law to check terror funding,” Mr Advani said. Comparing yesterday’s serial blasts in the North-East with that of the 1993 Mumbai serial blasts, the former Home Minister charged the Congress “of having aided and abetted the terrorist and extremist outfits that are now having a field day in different parts of the country which is “clearly evident in Assam”. In Assam, the Congress had openly accepted support of the ULFA, a banned secessionist organisation whose leaders were safely ensconced in Bangladesh, during the recent Parliamentary elections, the former Deputy Prime Minister observed. He charged that the Congress state government gave protection to ULFA and ULFA in return had provided patronage to Congress candidates. Mr Advani asked the government to forcefully take up with Bangladesh the matter of insurgent camps and leaders in that country. He further said that the Centre should ask Dhaka to hand over the ULFA leaders who were staying safely in Bangladesh. 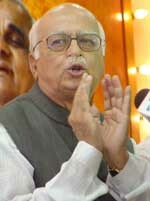 Describing the policy of the Congress government of Andhra Pradesh towards the People’s War Group (PWG) as “shortsighted”, Mr Advani said that by lifting the ban on the PWG, the Congress-led state government had endangered peace and security not only in Andhra Pradesh but also in several other states. He noted that West Bengal Chief Minister Buddhadeb Bhattacharya and Tamil Nadu Chief Minister Jayalalithaa had opposed it. Top leaders of the Bharatiya Janata Party had met this morning at the residence of former Prime Minister Atal Bihari Vajpayee to discuss the grim situation in the North-East and also the overall security scenario in the country. The BJP expressed concern over the worsening situation at the one-hour meeting, attended by Mr Advani, Leader of Opposition in Rajya Sabha Jaswant Singh, former Union Ministers Arun Shourie, Arun Jaitley, Parliamentary Party Deputy Leader Vijay Kumar Malhotra and BJP Vice-President Mukhtar Abbas Naqvi. Mr Advani said that the issue “deteriorating” internal security scenario would be raised in the coming session of Parliament. While Mr Thomas announced his country’s support of Rs 1555 crore ($ 190 million) for Sarva Shiksha Abhiyan over the next four years, Mr Hoon, diplomatic sources said, was not expected to make any specific announcements. Mr Hoon arrived here last night. The entire day today he was busy with “internal meetings”. He would be in Islamabad tomorrow where he would meet top officials of Pakistan, including President Pervez Musharraf. Mr Hoon would be back here tomorrow evening. His official engagements here would begin on October 6 when he would have talks with Defence Minister Pranab Mukherjee. He might also call on Prime Minister Manmohan Singh. On his arrival in New Delhi, Mr Hoon said: “I am pleased to be in India at a time when the relationship between India and the UK is growing so well. I expect the recent joint declaration signed by our Prime Ministers to take forward this relationship further. “The defence ties between India and the UK (have) never been stronger. This forms a dynamic and an important part of our modern bilateral partnership. The high-level joint exercises, exchanges and defence equipment co-operation clearly indicate the progressive nature of our defence links. Mr Jeff Wilson, First Secretary, Press and Public Affairs in the British High Commission here, told The Tribune that Mr Hoon’s visit was part of a major British Government initiative to work with the Indian Government to further enhance the strong relations between the two countries. He said no specific defence deals were going to be discussed during the two Defence Ministers’ talks. But London viewed the visit as a quick follow-up on the London meeting of the two Prime Ministers. Mr Hoon’s designation was the Secretary of State for Defence. He was the Cabinet Minister charged with making and executing defence policy and with providing the means by which it was executed. He was Chairman of the Defence Council and of its three Boards, (the Admiralty Board, the Army Board and the Air Force Board). The Secretary of State for Defence was ultimately responsible for all elements of defence and was supported by three subordinate Ministers: the Minister of State for Defence Procurement, the Minister of State for the Armed Forces and the Under-Secretary of State for Defence. The Secretary of State for Defence had the following specific areas of responsibility: (i) strategic policy and budgetary issues, (ii) direction of major current and potential operational commitments, and (iii) delivery of defence modernisation. Mr Roh is accompanied by a high-level official delegation, including ministers of foreign affairs and trade, commerce, industry and energy, and information and communication. During the visit, President Roh will meet President A. P. J. Abdul Kalam and hold talks with Prime Minister Manmohan Singh on bilateral, regional and global issues of mutual interest. 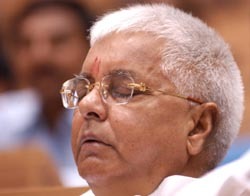 Vice- President Bhairon Singh Shekhawat and External Affairs Minister K. Natwar Singh will call on him. The last presidential visit from South Korea was when President Kim Young-sam visited India in February 1996. South Korea is India's eleventh largest trading partner. His main meetings would be on October 7 when he would call on President A.P.J. Abdul Kalam, hold delegation-level talks with Prime Minister Manmohan Singh, followed by lunch hosted by the PM in his honour. Later, the Chancellor would deliver the seventh Rajiv Gandhi Memorial Lecture on Peace and Stability in a Globalised World. He would be accompanied by Mrs Edelgard Bulmahn, Federal Minister of Education and Research, Dr Ditmar Staffelt, Parliamentary State Secretary in the German Federal Ministry of Economics and Labour and high-level official, business and media delegation. An MoU for enhanced cooperation in S&T between Department of Science and Technology and Max Planck Institute of Germany in the presence of Chancellor Schroeder and Minister of State for Science & Technology would be signed at the India Habitat Centre. "We had earlier proposed FTA with India. When leaders of the two countries meet the issue will figure in the talks", Korea's Commerce, Industry and Energy Minister Hee-Beom Lee said on the sidelines of a meeting organised by the Confederation of Indian Industry (CII) here. Commerce and Industry Minister Kamal Nath will be attending a business meeting with the President of Republic of Korea Mr Roh Moo-Hyun tomorrow. Mr Hee-Beom Lee will also call on Mr Nath tomorrow. Haryana strongman Bhajan Lal is going all out to set right the impression that his poor health has pushed him out of active politics. In an effort to silence his detractors, who have written him off in the coming Assembly poll on health grounds, Mr Bhajan Lal has chalked out a series of public rallies in the coming days. His programme will commence on October 15 at Ferozepur Jhirka in the Mewat region of Haryana and will continue till the month-end, covering all districts in the state. As PCC chief, Mr Bhajan Lal sees himself as a chief ministerial contender in case of a Congress victory. The objective of these rallies is two-fold: Mr Bhajan Lal aims to test the public mood and to signal that he is very much in the electoral fray. Ever since the Haryana PCC chief underwent a heart surgery some six months ago, there have been reports that his health might force him out of active politics. The Bhajan Lal camp has blamed his detractors for fuelling these rumours, particularly in view of the sharp divisions in the Haryana Congress unit. In fact, this had also led to speculation that Mr Bhajan Lal might be replaced as PCC chief. “I am absolutely fine. Like any machine, my body underwent an overhaul...but now there is no problem,” exclaimed Mr Bhajan Lal today, saying that he was raring to go for another decade or so. This episode has, however, once again highlighted the big challenge which the AICC faces in Haryana: The rampant factionalism in the state unit and the need to present a united front in the run-up to February’s Assembly poll. Mr Janardhan Dwivedi, AICC general secretary in charge of Haryana, has directed that all senior state leaders will participate in major rallies being planned in the next few months. A beginning was made about two months ago when the party had kicked off its election programme with a meeting at Kurukshetra when all state factional leaders had come together. According to ADR’s Maharashtra Election Watch report released today, 22.5 per cent of all candidates fielded by political parties in the state had criminal charges against them. In other words 366 of the 1625 candidates fielded by various political parties had cases registered against them in different courts. Of all major political parties in Maharashtra, the Shiv Sena fielded the maximum candidates with criminal cases against them. As many as 85 of the 163 Shiv Sena candidates were facing criminal charges. The BJP followed close behind with 46 of its 111 candidates facing criminal charges. Of the 124 NCP candidates, 31 face criminal charges. As many as 30 of the 157 Congress candidates, too, have criminal charges against them. Candidates with tainted backgrounds have been fielded by the BSP, the Samajwadi Party and several other smaller outfits, according to the ADR report. The number of tainted candidates was higher now than in last May’s Lok Sabha poll, the ADR said in its study. In all there are 200 “crorepati” candidates while a hundred others have disclosed nil assets. In all, 291 candidates had liabilities in excess of Rs 5 lakh owed in some cases to financial institutions. As many as 1062 of the 1625 candidates fielded by political parties have not reported their PAN particulars even though 54 of them had assets in excess of Rs 1 crore. Nearly a quarter of all candidates fielded by Maharashtra’s political parties did not complete school, the report said. On the other hand, 26.8 per cent candidates were graduates and above. Interestingly, 210 candidates did not live in the constituencies they were contesting the election from, the report said. 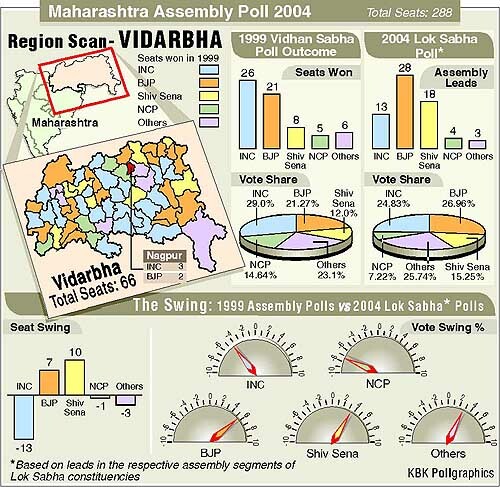 The BSP, which is contesting 272 of the 288 seats in the Maharashtra Assembly, has, however, targeted parts of Vidarbha, Marathwada and Western Maharashtra, where it hopes to make an impact. Apart from nominating candidates from the Dalit community, the BSP has managed to woo rebel candidates from the Congress, the NCP, the BJP and the Shiv Sena in many constituencies across Maharashtra. “The BSP is today in a position to affect the poll prospects of both the Congress-NCP and the Shiv Sena-BJP alliances in the state,” admitted BJP General Secretary in charge of Maharashtra Pramod Mahajan in Pune. Sources in the Congress and the NCP admit that Mayawati’s outfit has managed to woo their local-level leaders, particularly in Vidarbha and Marathwada and is poised to make a major impact in the poll. With the Congress and the NCP in an uneasy pre-poll alliance, aspirants from both parties who were denied the ticket are now flying the BSP standard. Ms Mayawati has also cleverly worked the caste equations in more than 125 seats in Vidarbha, Marathwada and western Maharashra in an attempt to arrive at a ‘winnable’ combination. The party’s candidates include those from the dominant Maratha community and at least one Brahmin. “There are many upper caste people who are no longer prejudiced against Dalits and we would like to have them with us,” said Ms Mayawati in Pune on Saturday justifying the BSP’s upper caste candidates. Though the BSP bagged just 3 per cent of the votes in last May’s Lok Sabha elections, most of its votes came from the Vidarbha and Marathwada regions of Maharashtra. The Congress and NCP candidates in 12 Lok Sabha candidates lost by wafer-thin margins after BSP candidates cut into their vote-share. Since then, the BSP has managed to consolidate its hold in the region by inducting local-level leaders in preparation for the Assembly poll. But in the run-up to the Assembly poll in Arunachal, the basic question is whether the outcome is going to offer a stable government or another phase of instability. This is more because of the known rivalry between the state Congress President, Mr Mukut Mithi, and acting Chief Minister Gegong Apang. Both of them are reportedly aspiring to be the Chief Minister. It is felt that if the defection drama, which started in 1998 when Mr Gegong Apang left the Congress to form the Arunachal Congress, resumes after the ministry is formed, the Arunachalis will suffer the most because all major problems of the state such as Naga insurgency, the Chakma refugee issue, stagnating development and others will remain unresolved. 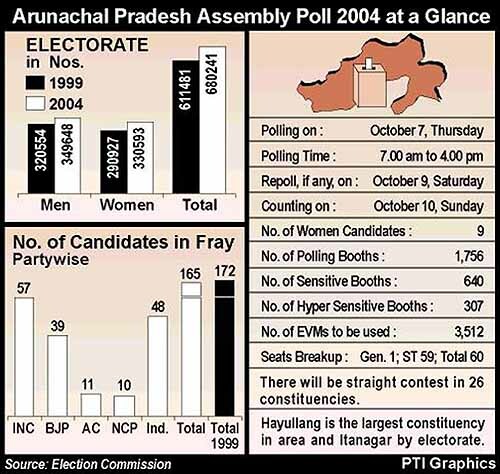 In the 1999 Assembly poll, the Congress had won with a decisive majority to form the government. The then Arunachal Congress President Gegong Apang had to be content with the failure of the Arunachal Congress. But a wily leader as he is, Apang, with the help of Kameng Dolo, ensured defection in the Congress. Which finally paved the way for the formation of the United Democratic Front (UDF) in 2003. Subsequently, with the majority of UDF MLAs, Mr Gegong Apang switched over to the BJP to form the first-ever BJP-led government in the North-East, replacing the Congress. Now Mr Gegong Apang, on whom the BJP was banking upon the most to put up a tough fight against the Congress in the coming poll, ditched the saffron party to befriend the Congress recently after the change of guard at the Centre. But Mr Gegong Apang’s decision to return to the Congress has landed the party in a difficult situation on the issue of deciding the Chief Minister after the poll. A habitual defector, feel observers, Mr Gegong Apang would certainly not like Mr Mukut Mithi to steal the show. Thus the chances of his defection from the Congress if Mr Apang is denied the post of Chief Minister can never be ruled out. While the Congress had put up candidates in all 60 seats of the state, with three seats having been won uncontested, the BJP could field candidates in 38 seats only. The NCP, the Arunachal Congress(D), are also in the fray. Meanwhile, flag marches are being conducted jointly by the Army and the Paramilitary forces in the border districts of Tirap Changlang to tackle underground outfits and instil confidence in the voter ahead of the October 7 Assembly poll. Arunachal Chief Electoral Officer Manoj Kumer Parida told this correspondent that besides the flag marches, close coordination was being maintained between the Army and the police for “area dominance” in the two districts adjoining Nagaland to tackle underground elements like the NSCN and ULFA during the polling. Though theoretically it is a fight between the Congress and the BJP in the coming poll dominated by 20 main tribes and 100 sub tribes, the real fight is between Mr Mukut Mithi and Mr Gegong Apang on the question of supremacy in the party which is likely to shape up the fate of the next government in the state. The decision to seek fresh clarifications was taken at the EC meeting, which was convened to discuss the government’s response to its letter dated September 30, asking detailed report from the Cabinet Secretary on the government decision. Earlier, the government in its reply to the notice had stated that the setting up of the commission on reservation for minorities was its old agenda and in keeping with the UPA government’s policy. The reply was sent today by the Cabinet Secretary in response the EC’s notice on the issue. It had, on September 30, sought a detailed report from the Cabinet Secretary, stating that the setting up of the commission for minorities was against the spirit of Para 1 of the sub clause 3 of the Model Election Code of Conduct, which prohibited the government and political parties from appealing to the voters along communal lines. A BJP delegation, which had called on the poll panel, had demanded that the Election Commission de-recognised the Congress and cancelled its election symbol for violating the Code by announcing the setting up of the commission. Without issuing notice to the Union Government, a Bench of Chief Justice R.C. Lahoti and Mr Justice G.P. Mathur sought to know the stand of Union Government on the issue. The matter was brought before the court by an NGO, Federation for Upliftment of Depressed Classes (FUDC), which said the people belonging to the SC and ST were not allowed to vote freely. The states where the delimitation of SC and ST constituencies was sought by the FUDC, included Haryana, Bihar, Maharasthra and Jharkhand. The delimitation was sought on the ground that it had been earlier done on the basis of the 1971 cesus, while the population of the SC and ST had gone up. chosen by the petitioner because the elections were round the corner there. It has sought delimitation on the basis of the 2001 census. The petitioner’s counsel Sugan Chand Agarwal, who has been doing cases of people belonging to the weaker sections free of cost for the past several years, told the court that he had earlier approached the Election Commission on the issue but “did not get any satisfactory reply from it”. “The government should be asked to arrange more polling booths in the residential areas of the SC, ST and backward classes and deploy armed forces to assure safety of life of the voters from the weaker sections,” the FUDC in its PIL said. The notices were also issued to 22 political parties, with religious names, by a Bench of Chief Justice R.C. Lahoti and Mr Justice G P Mathur. The court had earlier sought impleading of all states and Union Territories in the case as most parties, whose derecognition had been sought by a petitioner, were regional parties. In a PIL petition, ex-armyman N. Kunju said the registration of political parties with religious names were against the spirit of the Constitution, which provided for establishment of India as a “secular state”. The court also issued notices to six national parties, including the Congress, the BJP, the CPI, the CPM and others seeking to know their stand on the issue. The political parties included the Hindu Mahasabha, various factions of the Muslim League, the SAD, the Akali Dal (Mann) and some other Akali factions. The Prime Minister, Dr Manmohan Singh would formally confer the fellowship, limited to 21 ‘immortals of literature’ at a time, on the Jnanapith Awardees at the inaugural of the Golden Jubilee celebrations of the Akademi on November 1. The fellowships have also been awarded to Bengali poet and writer Sankha Ghosh, eminent Rajasthani and Hindi writer Vijay Dan Detha and Telugu linguist and scholar Prof B. Krishnamurti. Kannada writer Anantha Murthy, made his debut into the literacy scene nearly four decades ago with his first novel ‘Samskara’, and has published more than 25 works, including novels, poems, short stories and essays. The 71-year-old writer, who taught English at Mysore University, had been the Vice-Chancellor of Mahatma Gandhi University, Kerala, president of the Sahitya Akademi and chairman of the National Book Trust. Punjabi writer Amrita Pritam, has over 70 works to her credit, including poetry collections ‘Thandian Kirna’ (1935) and ‘Kagaz te Kanvas’ (1970) and novels ‘Pinjar’ (1950), ‘Na Radha Na Rukmani’ (1984) and ‘Khabarnama’ (1994). The 85-year-old writer, who lives in Delhi, is also a former Rajya Sabha member. Her book on the Partition was recently adapted for the screenplay of the movie Pinjar, showcasing the plight of women during the turbulent times. The kar sewa, if carried out, would perhaps be the first to be carried out by Indian Sikhs in Pakistan. “The government of Pakistan, Punjab and the Wakf Board have allowed us to carry out renovation work at Gurdwara Ram Das in Chuna Mandi, Lahore, and at the same time build a yatri niwas for pilgrims in a college adjacent to Gurdwara Nankana Sahib,” Mr Paramjit Singh Sarna, president of SAD, Delhi, told reporters here. Talking to The Tribune from Amritsar, SGPC president Jagir Kaur said the SGPC objected to the decision of the Pakistan government to allow a political party to carry out kar sewa. “The SGPC is the highest and the most revered body of the Sikhs and such a holy work like kar sewa has not been and should not be given to any political party,” she said. The SAD Delhi chief said the Pakistan authorities had agreed to allow multiple visas for 20 persons from India. “We plan to keep sending people from here in groups to peform the kar sewa there” he said, adding that “this would further boost the relations between the two countries. He said Islamabad had already allowed Sikh nationals from Britain, the US and Canada to undertake kar sewa of the gurdwaras and guesthouses there. Mr Sarna said the kar sewa deal was finalised last week during his visit to Lahore, where he met the Chairman of the Wakf Board, Lt Gen Neem Akbar Khan, and president of Pakistan Gurdwara Board, Shyam Singh. The renovation would be done under the guidance of Baba Jagtar Singh from Amritsar. Architects from Pakistan would be involved in the renovation. “We estimate that around Rs 10 crore will be used, which will be sent by us directly to the gurdwara there,” he said. During the deliberations, there will be regional presentations by member countries on selected topics of drug and organised crime, public security and terrorism, trafficking in humans, financial and hi-tech crimes, besides fugitive and investigative support. The CBI Director will place India’s concern on the agenda and will take part in the special meetings of the heads of National Central Bureaux during the session, a CBI press note said here. The SC in its order of July 19 directed the Welfare Commissioner (Bhopal Gas) to submit to the apex court a detailed action plan for disbursement of the remaining amount of the compensation among the victims and start disbursement on October 1. The plan was submitted to the SC on September 30 by the Welfare Commissioner. It has a rider: More than 11,000 cases are pending disposal from the first round of compensation disbursement. Besides, the Welfare Commissioner has approached the Madhya Pradesh High Court for limiting the period of appeal against the order for payment of compensation to one year. The SC had ordained compensation of Rs 20,000 to Rs 4 lakh for injuries and Rs 1 lakh to Rs 5 lakh in the case of death. According to the Bhopal Gas Peedit Mahila Udyog Sangathan convener, Mr Abdul Jabbar, the minimum amount of compensation was paid in 95 per cent of the cases. Mr Routray was admitted to S.C.B. Medical College Hospital towards the end of August following complications. He was the Chief Minister of the state between 1977 and 1980 and was a former union minister. Mr Gujral, who is the chairman of SAHR, would be in Lahore for the two-day meeting of SAHR from October 15. The meeting would discuss issues relating to human rights, fishermen and trafficking in women. Renowned Pakistani lawyer Asma Jahangir would be the co-chairperson of the meeting which would be attended by repesentatives from Pakistan, India, Bangladesh, Sri Lanka and Nepal. The previous meeting of SAHR, a NGO, was held in Sri Lanka.